Of all the bands I’ve ever worked in, this is probably the most comfortable! Three top English fiddlers, backed by solid keys and one of the best percussionists around – augmented by three brass of which I am one. Formed in 1974 as ‘The Cotswold Liberation Front’ it quickly became the Old Swan Band, named after a Cheltenham pub. Originally melodeon led (by Rod Stradling), it changed to a fiddle band in 1982 which was when I joined as a trombone player. Jo Freya played sax (as did percussionist Martin Brinsford occasionally) but the brass section consolidated when I recruited one of my Salford students, Neil Gledhill, who plays a bass sax – a rare beast of an instrument! This line up didn’t record for many years but was finally enticed into a studio on Mayday 2004. Since then there have been three CDs from the band. Below is some text from the 2004 CD booklet about the history of the band. Old Swan started life in 1974 as ‘The Cotswold Liberation front’ and members included Bernie Cherry, Robin Lister, Rod and Danny Stradling, Martin Brinsford and the incredibly young Fraser sisters, Fi chaperoning the 13 year old Jo. Singer Ken Langsbury joined in on occasional concerts. Based in and around Cheltenham, it was one element of the new liberation movement for English music, a hint of a tidal reverse against the flood of English musicians who played Celtic music and ignored or were ignorant of the treasury of English tunes that existed not only in written form but also as a living tradition. Alongside the predominance of Celtic tunes, the style of English barn dancing was becoming increasingly complex with dancers walking or even running rather than stepping. In answer, Old Swan’s band style was deliberately slow in an effort to encourage dancers to dance. The first recording, ‘No Reels’ (1977) was a revolutionary album. Jo remembers going to sessions where musicians played the entire album from beginning to end verbatim (or whatever the musical equivalent is). The band was criticised greatly by less tolerant members of the English Folk Dance and Song Society for ‘playing the wrong tunes to the dances, playing too slow, changing tunes, using melodeons instead of proper instruments like accordions and worst sin of all, using brass instruments’. Despite these ‘sins’, the band has survived into the new millenium and still plays dances with the able assistance of regular caller Dave Hunt. Other bands were riding the same reverse tide – New Victory Band in the North of England, Flowers & Frolics in London, Pump and Pluck on the south coast and more. Piano and brass started to be used extensively and Old Swan were no different, introducing trombone and sax. More albums happened – ‘Old Swan Brand’ (1979), and ‘Gamesters, Pickpockets and Harlots’ (1981).Members came and went including Chris Bartram, Ron Field and Mel Dean but a major sea change occurred in 1982 when Rod and Danny left the band. Considering them irreplaceable in their roles, the decision was made to go for an all fiddle line up. 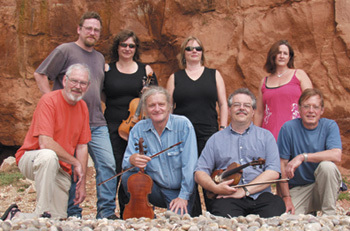 Whilst the Stradling’s name will always be synonymous with the band, the fiddles created another unique sound, the one you have here delivered by founder member Fi, now joined by the formidable talents of Paul Burgess and Flos Headford, leaders in the field of English fiddling. John Adams joined the brass section after the demise of The New Victory Band, Richard Valentine moved off the piano stool in favour of Heather Horsley and Neil Gledhill was press-ganged into the band playing the rarely heard bass sax. Somewhere in the middle of these changes, a version of the band made an EP record (1983) and that was the last studio recording until this one. Rumours that occasionally surface about the band’s demise are greatly exaggerated and Old Swan now enters its thirtieth year presenting here the 2004 version of its English Dance Music. We hope that the magic influence of those early Swan Band pioneers still shines through and that the playing of present members brings a tap to your foot and an inclination to dance.